This has been prepared for notaries about the laws governing their duties and is not intended as legal advice. For additional information or for difficult situations, it may be advisable for the customer to seek the advice of a licensed attorney. 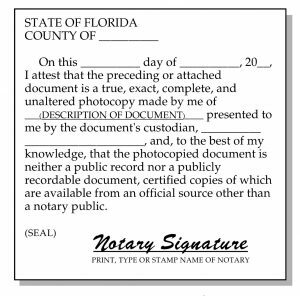 In Florida, notaries are authorized to attest to the trueness of photocopies of certain documents. Although commonly known as certified photocopies, the notary refers to these documents as attested photocopies. A notary public may make attested photocopies if the following criteria are satisfied. ■ The document must be an original document. A notary public cannot make an attested photocopy from a photocopy, or from another certified copy. ■ The document cannot be a public record, certified copies of which are available from another public official. If a certified copy can be obtained from the official source, then the notary public should decline the request. ■ The making of the photocopy must be supervised by the notary public. It is not sufficient for the notary public to compare the photocopy with the original document. The notary public must actually make the photocopy or supervise another person while he or she makes the photocopy. After making (or supervising the making of) the photocopy, the notary will complete a notarial certificate in substantially the same form as prescribed by law. ■ Any document for which photocopying is prohibited. This is not a complete list of public records. If the document is issued by a government entity, the notary should contact that entity to determine whether a certified copy is available. If one is available, then the notary public must decline to make an attested photocopy. Additionally, the notary should ask the person if the document has been filed in a court proceeding or in the official records at the courthouse. We don’t provide Certified Copies of Birth Certificates. Our company continues to receive numerous inquiries about certifying copies of birth certificates. A notary public may NOT make a certified photocopy of a birth certificate, whether it was issued in Florida, another state, or a foreign country. Birth certificates are official records and certified copies may be obtained from the public official who is the custodian of the records. The typical problem arises when a person is leaving the country within a few days and is required by his or her travel agency to have a “notarized” birth certificate. The word “notarized” immediately sends the person to a notary public. Actually, a person should obtain a “certified” copy of his or her birth certificate, rather than a “notarized” copy. Notaries should decline to certify or notarize these documents for two reasons. First, a notary public may not attest to the trueness of a photocopy of a public record if a copy can be made by another public official. The Florida Department of Health retains vital records such as birth certificates, death certificates, marriage licenses, and certain divorce records. The Department produces certified copies of these documents when requested by an authorized person. Second, a notary public may only attest to the trueness of a photocopy of an original document. Most people do not possess their original birth certificate; they only have a certified copy. Additionally, Florida law prohibits even the photocopying of birth certificates. This would eliminate the alternative procedure of attaching an affidavit to a photocopy of a birth certificate in which a party swears that the photocopy is a true copy of the birth certificate. Officials at the Bureau of Vital Statistics in Jacksonville, where Florida vital records are housed, report that birth certificates and other vital records are available from their office and may be available for the last 30 years from the county health department in most counties in Florida. The Jacksonville office takes orders by telephone using a major credit card for payment and even offers express or overnight delivery for an additional fee. It is best, of course, to request such records in writing allowing 2-3 weeks for delivery. For telephone orders or additional information, the party may call the Jacksonville office at (904) 359-6931 or (904) 359-6912. How do I apostille a document in Florida? May a Person with a Disability Direct Another Person to Sign? Can you notarize my signature if the identification that I have is different from the name being signed? Copyright 2019 A MOBILE NOTARY SERVICE COMPANY. All Rights Reserved.